Self-awareness is fundamental to the success of sport psychology interventions and a quality associated with both developing and performance excellence. It can help athletes to build self-confidence and self-esteem, take more responsibility for their actions, as well as make better decisions. As such, self-awareness is not only vital for sporting success but many other aspects of life, including school, work, and family. A lack of self-awareness may lead athletes to struggle to regulate their own thoughts, feelings, and behaviors as well as assert self-control when needed. It may even cost an athlete by letting negative thoughts or emotions spiral out of control and getting distracted. As explained by Jackson and Csikszentmihalyi (1999), “without self-awareness an athlete misses important cues that can lead to a positive change in performance” (p. 105). Not only may being unaware harm performance, but it can also increase the possibility of other detrimental effects such as burnout or injury and negatively impacting interpersonal relationships. Unfortunately, many athletes are not very self-aware. Younger and less experienced athletes might find it particularly more difficult to recognize certain aspects of themselves. A sport psychologist can help them by using a variety of techniques and activities. Like any other mental skill, and self-awareness needs to be regularly exercised and used in different ways or settings. In this post, I provide new practical suggestions for filling up a sport psychologist’s toolbox for developing self-awareness in their clients. I have adapted these activities from educational and organisational psychology for use with athletes, and these may also be useful for coaches, parents, and teachers. A step towards having a better understanding of yourself involves observing and paying more attention to your thoughts, feelings, and behaviors. Taken from the concept of mindfulness, athletes can be taught to be more aware and focused in the present moment using meditation, guided imagery, and relaxation exercises. A very simple exercise would be to ask the athlete to close their eyes and observe their normal breathing pattern. Ask them to notice the rhythm, rate, and depth of their breathing. Once they are comfortable in this exercise, they may wish to progress to other types of focused breathing or body scan exercises. Most sport psychologists will be familiar with performance profiling as a useful technique for helping athletes to become more aware of their strengths and weaknesses. To further develop this skill, I also recommend a S.W.O.T. analysis as a follow-up discussion on how an athlete can use their strengths, overcome weaknesses, and consider their opportunities and threats. 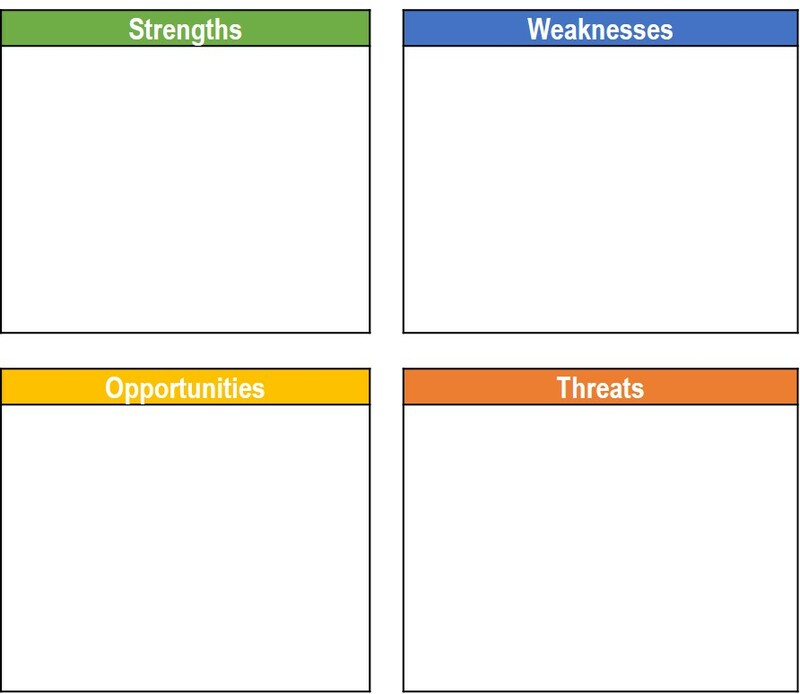 This activity involves the athlete thinking about their Strengths, Weaknesses, Opportunities, and Threats using a simple grid. Strengths and weaknesses can be systematically identified via a performance profile or through a simple brainstorming exercise. Another suggestion is to ask the athlete to describe how other’s would see their strengths and weaknesses (e.g., how would your coach describe what are your greatest strengths or weaknesses that you do not see?). Ask the athlete to reflect on what opportunities exist for them in the future. These could be potential future strengths. Similarly, what are future threats? These are potential goal-busters that might be obstacles or challenges that hinder goals the athlete would like to achieve in the future. Ask the athlete to reflect on the four areas and what they learn from about themselves from this analysis. How can you Use each Strength? How can you Stop each Weakness? How can you Exploit each Opportunity? How can you Defend against each Threat? The Johari window is useful for helping athletes to recognise their blindspots (e.g., certain attitudes or beliefs) as well as discover aspects of themselves they may have never fully appreciated (e.g., underestimated ability or skill). It may also be used to help build trust and open up lines of communication, for example, when trying to improve relationships with coaches and teammates. Open self: What is known by the athlete about him/herself and is also known by others. Blind self: What is unknown by the athlete about him/herself but which is known by others. Hidden self: What the athlete knows about him/herself that others do not know. Unknown self: What is unknown by the athlete about him/herself and is also unknown by others. Click here for an excellent resource on how to use the Johari window and additional background information. As a fourth area for developing self-awareness, there are several activities that can help athletes to become better aware of their identity as well as core beliefs and values. Ask athletes to complete a mind map answering the question “who am I”? Answers will likely fall into different categories, including social roles (e.g., a starting player, son, brother), personal traits (e.g., happy, confident), and physical description of oneself (e.g., I am tall, muscular-frame). You can then ask the athlete to reflect on areas about themselves they may have overlooked or emphasized greatly (e.g., only describing themselves as an athlete and overlooking social roles; only describing themselves by social roles and not personal traits). Asking an athlete to write their own mission statement can help them to identify core beliefs and values. It can help them to understand what is important to them and remind themselves of the reasons why they participate in their sport. This activity may be particularly helpful for athletes who are struggling with their motivations or facing difficult decisions about their futures in sport. Click here for great suggestions on what to include in the mission statement. In this post, I have explored well-established ways for developing self-awareness in business and education, but have not received much less attention within applied sport psychology. I hope these suggestions inspire sport psychologists to consider how they may use these as well as other innovative ways to help athletes to continually develop their self-awareness in different ways. All to often, I think we limit ourselves to a few well-known techniques such as interviews, questionnaires, and performance profiles. Although these are useful tools, effective sport psychologists will have different ways to address a lack of self-awareness as well as related issues such as problems with coach-athlete relationships and motivational issues. Importantly, to keep sport psychology applied work evidence-based, I call on more intervention research to investigate developments in self-awareness and the resulting benefits for athletes. Have you used any of these activities in your work with athletes or have any other suggestions? If so, please leave a comment. I would love to hear from you! Cottrell, S. (2003). Skills for success: The personal development planning handbook. Basingstoke: Palgrave Macmillan. Jackson, S.A., & Csikszentmihalyi, M. (1999). Flow in sports: The keys to optimal experiences and performances. Champaign, IL: Human Kinetics.